When you drink full proof and overproof rums for a long time, many forty percenters can seem, well…a shade pusillanimous. 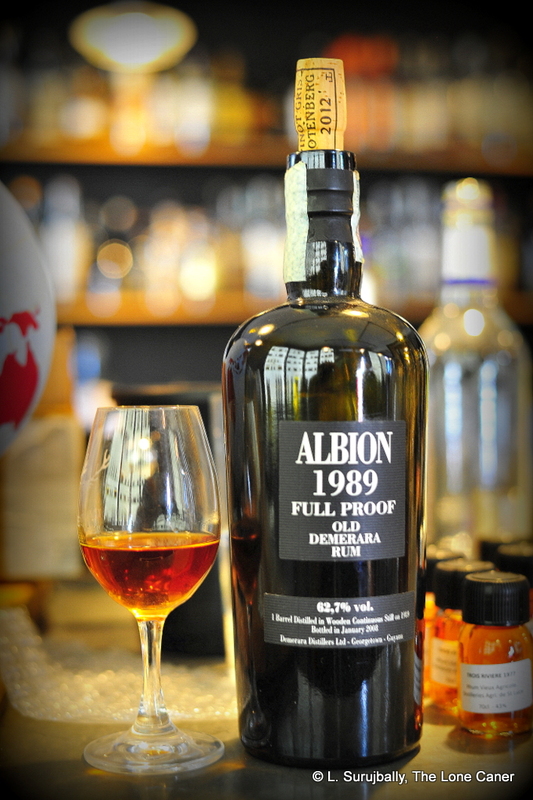 No such issue afflicts the 62.7% full proof of Albion 1989, ‘cause that thing looks and feels and samples like it’s about to father a nation. 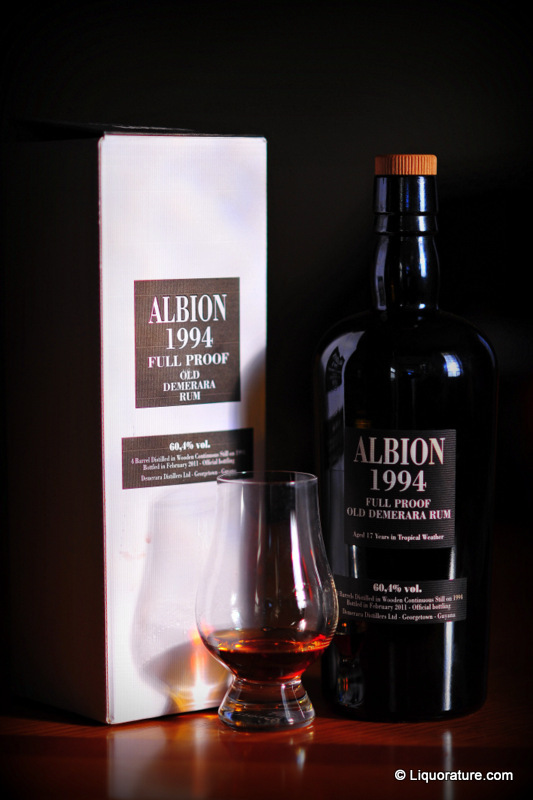 The Albion 1994 was power and passion and style all wedded together in a remarkable fusion, and my only regret has always been that I couldn’t get more. It was preceded by a version from 1983, 1986, and this one from 1989. These days, the only place you’ll find either is from a collector or on the secondary market. And that wasn’t helped by the paucity of output for the 1989 either. I’m always whining about craft makers bottling too few rums in their single barrel or cask strength issues, yet this one is bordering on the ridiculous – Velier only issued 108 bottles of the Albion 1989. 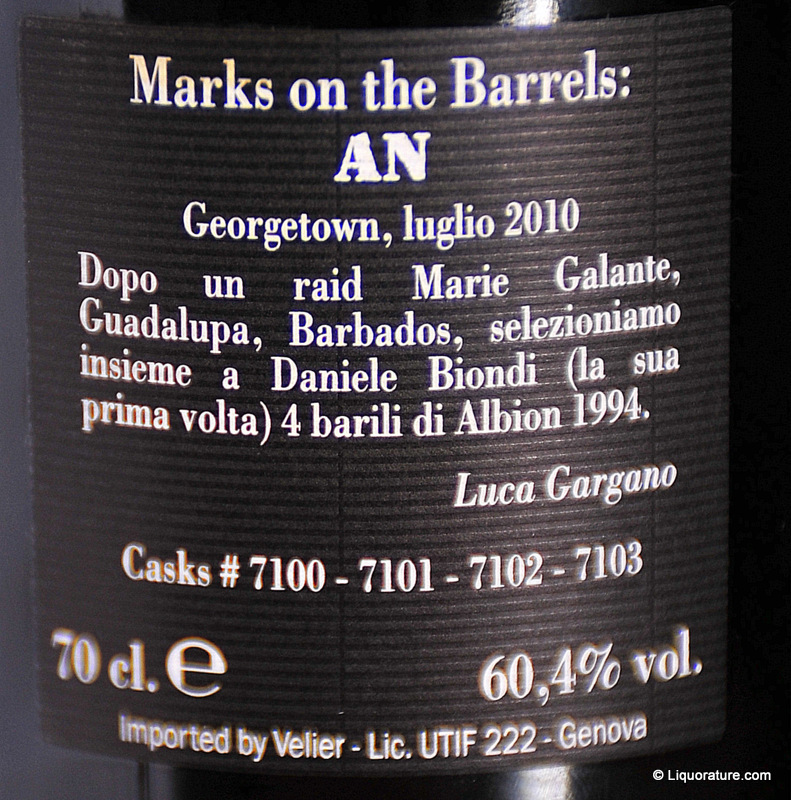 Still, points must go to Luca Gargano, who resisted the temptation to blend this miniscule output with something else, and simply took what he could from the single barrel in 2008, added nothing, took away nothing, diluted nothing, tampered with nothing. And there you are. When I poured the dark amber rum into my glass in Paris a while back (I was shamelessly pilfering tasting notes on anything in grabbing range, nearly knocking over poor Serge Valentin in my haste to get my grubby paws on this one), it was like coming home. Nosing it, I was struck anew how amazing it was that a rum can be made at that kind of strength and yet still maintain a smoothness of profile that doesn’t do a rabid dog imitation on your senses. The rum’s nose was immense – it smelled thick, creamy, like a melting licorice waterfall; black grapes, anise, caramel, burnt sugar billowed up, being chased by the sweet fresh honey from a cracked comb. I thought I’d get some wax or rubber notes, but nope, none here. The taste of the 1989 was wired up, juiced up, and electrified like the Tokyo downtown, and you got into it immediately. I remember just shaking my head with admiration, even awe, after the first sip. The palate was full bodied, without equivocation. Thick and creamy, surprisingly sweet, and not dry or briny – but there was tobacco and rubber floating around in the background, some furniture polish and tar (actually quite similar to a Caroni). Dried fruits emerged, mango and papaya, some salt in the back taste. I added some water and it continued providing new, strong notes of vanilla, nuts, aromatic pipe tobacco and smoke, leading to a long, long finish, with rubber, melting tar, more smoke, more caramel, more vanilla. I kept a glass charged with this stuff for literally an hour, always coming back to it, always finding something else and still probably missed something. I’ve always enjoyed experiments in the craft like this, where the makers change just a single coordinate in the standard equation of the rum universe just to, I dunno, mess with it and see what’ll happen. Here, that’s a hell of a lot. Even with the overall excellent stable of rums Velier makes (and that’s plenty), there are rums and then there are rums. This, in my opinion, is one of the latter. See, a rum like, oh, a Bacardi for instance, sells so much that it creates its own weather system in the spirits world. The Albion 1989 is nowhere near that league – at best it’s an intense, localized twister with a shard of lightning thrown in. Can you see yourself rushing out to experience that? Not likely. But if you’re a person looking at the world through slightly askew lenses, the phenomenal power and quality of something this spectacular cannot be overstated and after you’ve experienced it, it’s highly unlikely you’ll ever worry too much, in rum terms, about another cloudy day, threatening rain. 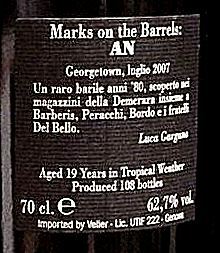 Like the 1994, it is remarked as being from a wooden continuous still, about which I have my doubts. Distilled 1989, bottled 2008, 108 bottles. Full proof rums – I like that term. There’s a desert of rum strengths between 46% and 75%, the latter of which is what is often referred to as an overproof (for my money, anything over 50% qualifies). So to use “full-proof” seems right to distinguish rums in that arid wasteland of strength. They are the closest that rums will ever get, in my opinion, to the expressions of whiskies my sadly misguided Liquorite squaddies swoon over. I hang around those scotch swilling maltsters enough to understand the hushed and trembling voices, the bared and bowed heads and the misty eyes they get when speaking about “Glen Muddy 1993 Edition 57%”, or “Port Peathead Cask Strength Release 49 of 1975 60%” – here’s one of the few rums I’ve seen that matches such products strength for strength, style for style. Writing this, I fondly imagine the Maltmonster shuddering and shaking his head, muttering insalubrious deprecations under his breath at such insolence….and I smile. The Albion wanted to prove to me that its ominous appearance was no accident. A thick-yet-sharp, fruity scent lunged right out of the glass, ready to fight, with sulphury notes of burning rubber and sun-warmed asphalt (remniscent of the older Rum Nation Jamaican 25) making themselves known right away. Then they exited the scene in a hurry, making way for deep odours of olives, raisins, black (definitely not red) grapes, heated without sharpness, which in their turn receded as the glass opened up, to reveal subtler hints of wine and sharp tropical fruits – mango leavened with freshly-cut, barely ripe papaya. White pepper and molasses fought for the last bit of nose that was left. A solid, fascinating and chewy nose, amazingly warm – for the aficionado, this might eclipse the el Dorado 25 year old 43% or the 21 year old, let alone Rum Nation’s new 1989 Demerara 23 45%. The palate was as stunning as the nose had been. Full bodied and deep, oily and heated and without any hint of malice in its Mordor-inspired dark burn. The taste in the mouth was shamelessly aggressive, packing so many steroids that it wouldn’t surprise me if one day it would decide to grow out of the bottle. Slightly salty and dry, it thundered along like a mack truck of flavour – cranberries, orange peel, lemon zest, sea salt (yes, really), molasses, oak, smoke, softer red guavas (not white), a faint background of sherry and licorice, just enough to tease without asserting any kind of biceps. Yes it was strong, yes it was a beefcake (come on, 60.4%? of course it was) – and yet at no point did I feel my senses were being pillaged, raped or plundered. Frankly, it was one of the best, meanest, hairiest shots of my experience, handily eclipsing the SMWS Longpond 9 year old – it evinced the phantasmagorical labial clout of an acid trip. And as befits such a powerful drink, the finish was epic – long and lasting and just held back from bursting into flame, presenting a lingering aftertaste of licorice, lemon peel and oak. I served this up to two dedicated maltsters, and you should have seen them abandon their vintage Springbanks to try a few extra shots of my baby, wistfully asking where in Calgary I’d found it. Albion is a sugar plantation (and village) in the Berbice county in the east of Guyana, once owned by Bookers McConnell, and perhaps more renowned for its cricket ground where famous international and regional matches have been played over many decades. From my perspective it’s more renowned for the unique rums of its sugar, but I confess to a small bias that way. Albion had a French Savalle still which I’m supposing made this product – but you see, although the box and bottle refer to a wooden continuous still, that can’t be right since there’s no wooden still in Guyana except those that hail from Enmore, Port Mourant or Versailles (with only PM being continuous), so there may be some clarification required here. Yet I have my lingering suspicions even without that…the taste is too rich, too redolent of a PM rum, to be taken at face value based on nothing but labelling. This rum was taken from several barrels originating at Albion prior to the consolidation. However, it was made not by DDL, but by an Italian/Swiss outfit called Velier (certainly one to watch) run by Luca Gargano. Before I knew this, I actually contacted my father and told him to talk to DDL’s higher ups about it, so impressive was the Albion, and it occurs to me now that perhaps an apology is in order. I like Demerara-style rums best, with Panamanians a close second. Yet even within the Guyanese context there are rums and then there are rums. DDL’s El Dorados in particular are superlative: dark, heavy, full-bodied bastards, deep flavoured and aromatic to a fault. Yet in attempting to gain market share and widespread acceptance – as they have – they too timidly shy away from issuing rums of real power. Velier’s full proof line seeks to rectify this shortfall, and does it ever succeed. 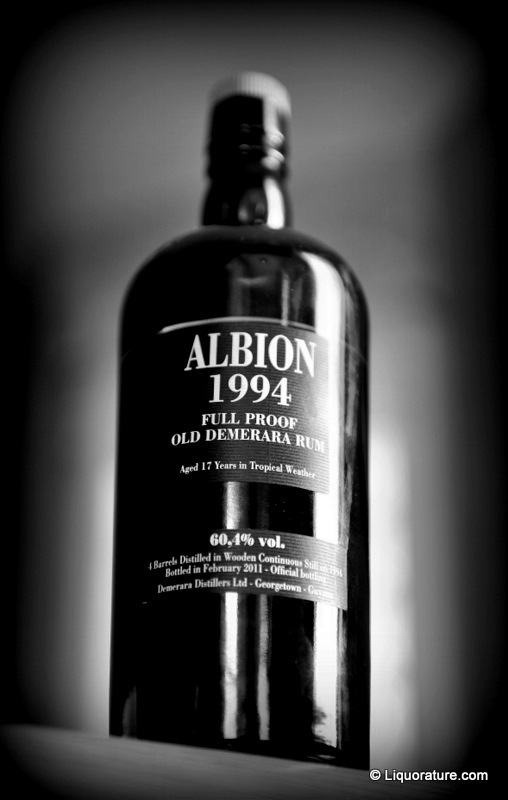 The Albion 1994 17 year old bashes the throat, buckles the knees, and brings tears to the eyes as it trumpets its beefcake badassery to the world. It may lack some creature comforts and doesn’t condescend to Pavlovian palates conditioned to softer 40% rums…but for those seeking a raw, powerful experience with a taste that reaffirms their cojones, this uncompromising, snarling medicine is just what the doctor ordered. Addendum. Fellow Mudlanders will know that Albion is closer to the Berbice River than to the Corentyne, and therefore my two word summary above is somewhat misleading with strict reference to geography. The Corentyne coast more reasonably includes Port Morant than Albion, which is actually East Berbice-Corentyne…in this instance I ask the reader to understand my reference to Mittelholzer, and therefore why I would use the term in such a context. Carl Kanto of DDL, in answer to my query about the wooden continuous still issue, said this: “There was a wooden continuous still at Albion. The type of rum depended on the operating parameters of the still. It was probably scrapped for more efficient metal Coffey stills. For sure it no longer exists.” All I can says is that that’s a crying shame. This rum, tried in 2012, marked my first encounter with Velier. Since then they have gone on to become an independent rum behemoth, while DDL, which I praised so much here, has been excoriated for its dosing practices, and while they issued some full proof rums of their own in 2016, don’t seem to have taken the project as seriously as other rum makers have.